Our catalogue is produced every 18 months. Our dedicated staff work on this major project throughout the period to produce the publication. It is launched with the industry publication Silicon Chip Magazine and the enthusiast maker magazine DIYODE. It is also bulk distributed to many organisations directly upon its release. Direct download links are also below. Whilst we believe it is a pleasure to read and peruse, we highly recommend using this website for everyday reference for the most up-to-date information on the latest products, pricing and availability. Click on the ORDER PRINTED COPY button at the bottom of this page. Enter your details or login to load your details automatically from your account profile. Sorry we cannot ship individual catalogues to international addresses, however we can ship with your order if you require a printed copy. Simply search for "B 0219" on our website and add it to your online order. 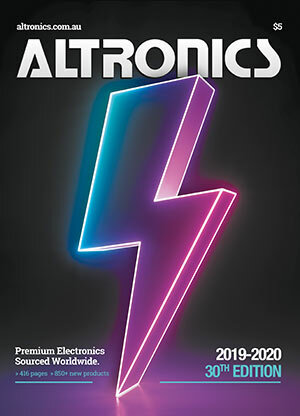 See the links below to access either a complete copy of the Altronics 2019-20 catalogue or individual pages. Please note that these files have been processed at a low resolution to ensure fast loading. If you require additional detail on product images, diagrams etc, you will find it is a better experience browsing for the product on our website instead.